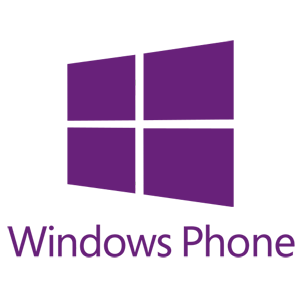 Microsoft has officially announced Windows Phone 8.1 during the BUILD 2014, keynote address. The Windows Phone 8.1 update brings several new features, and design improvements to Microsoft's mobile platform including a digital voice assistant named Cortana, Action Center, More Live Tile options, Start Screen backgrounds, Internet Explorer 11, and nw lockscreen designs. 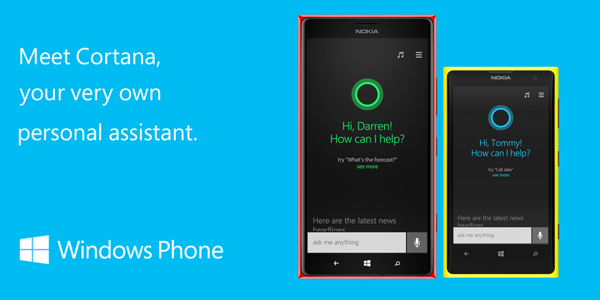 Cortana is Microsoft's response to Siri and Google Now. The company has built their digital voice assistant by carefully studying their competitors and thus offering an assistant with a personality who is also proactive. Gamers will probably recognize the name Cortana, as it has been inspired from the Ai character in the popular Xbox game Halo. Cortana will be able to access just about everything on your device, and will be integrated with core OS applications, such as phone, messaging, calendar, email, alarms, etc. 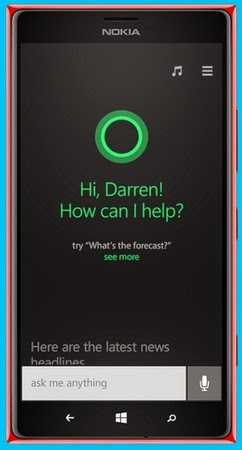 This means that not only will Cortana be aware of your contacts, appointments, messages and more, but it will also be able to do some useful work for you, such as initiating a call, setting up an appointment or alarm, or reading your latest email - you just need to ask us using natural language. However, Microsoft is also adding some more advanced capabilities to its digital assistant. For example, the user can ask Cortana to remind them about something the next time that they are talking with a certain person! This way, the next time you're having a call, or a chat stream with that person, Cortana will tactfully remind you about whatever it is that you wanted to share with that contact. Sounds neat, right? What's more, Cortana has been designed so that it can be integrated with third-party apps and services, such as Skype, Hulu Plus, or Facebook. Cortana will maintain a notebook, much like a real world assistant, tracking the interests and likes of the user. Everything that Cortana learns about you will be stored in this Notebook, which the user can access and edit, thus personalizing what information will be accessible to Cortana. Cortana will also have its own Live Tile, but the system has also been built into the Search key replacing the former Bing app. Cortana will be powered by Bing and will use its search expertise to find what you want online. Cortana will be initially launched in beta with Windows Phone 8.1 but will eventually loose the beta tag as the service is updated and made available across the world. The Action Center is the other major inclusion to Windows Phone 8.1, giving users a one stop location to view all their recent notifications. Much like with Android and iOS, Windows Phone users will be able to slide down from the top (even when the phone is locked) and reveal the Action Center. Along with the notifications from Facebook, calls, emails and others, the Action center will also contain toggles for Wi-Fi, Bluetooth, Airplane Mode and Internet Sharing. 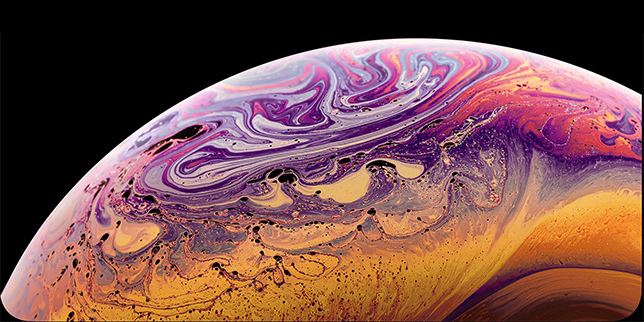 Windows Phone 8.1 will allow users to assign a background (wallpaper) to your Start Screen. The Live tiles themselves will turn into windows of sort allowing you to view the backgrounds behind them. Based on the leaked videos it seems that the backgrounds will offer a parallax effect when the user scrolls through their tiles. The Windows Phone 8.1 update, which was officially announced today will feature a new highly interactive lockscreen theming system, which was built in collaboration between Microsoft and super-developer Rudy Huyn. With Windows Phone 8.1, Microsoft is once again updating the wonderful Internet Explorer browser that comes with its mobile platform. Internet Explorer 11 brings some new and notable features, such as InPrivate browsing (browsing the web without leaving any data about you), tab synchronization between the user's Windows devices, file uploading capabilities, WebGL and normal mapping support, as well as a new YouTube HTML5 player. And yes, you will be able to have more than six tabs open at the same time. The above mentioned features are just some of the enhancements headed to Windows Phones with the Windows Phone 8.1 update. Microsoft has also added a number of smaller improvements to the OS. 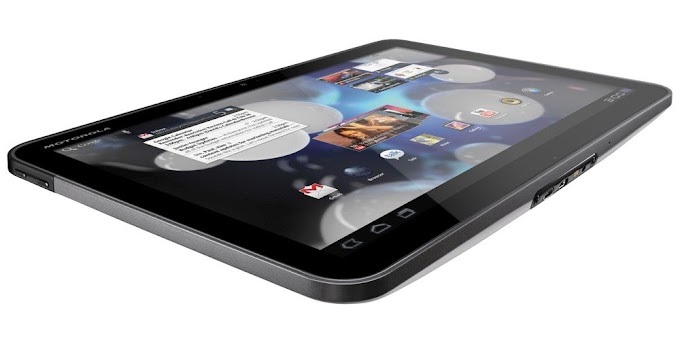 Some of the most notable ones include an enhanced application store, a week view for the calendar, Swype-like input method for the built-in QWERTY keyboard called Word Flow, an easy way to transition from a voice call to a video call, and a new Wi-Fi Sense tool. The latter is designed to carry out a host of Wi-Fi-related purposes, such as new Wi-Fi network suggestions, automatic connection to free networks, or providing a secure way for your guests to connect to your home Wi-Fi network. There is also an updated Data sense to manage your monthly carrier data allowances, to make sure you don't use more than your allocated data. Currently Windows Phone users can capture photos on their Windows Phones and view them on OneDrive. Users can also create a PowerPoint presentation on their PCs and edit it on their phones. With Windows Phone 8.1, Microsoft will enhance this further. 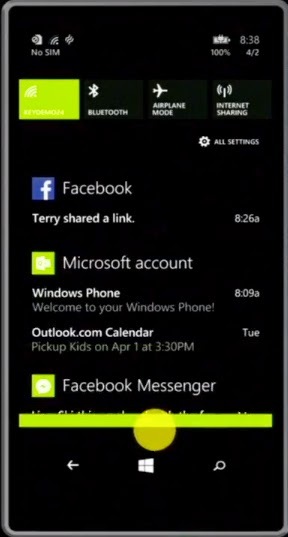 For example, the color theme on your Windows Phone, will be transferred to your PC. This will also be applicable when using the IE11 browser on both you phone and PC. Microsoft has officially announced their first major update for Windows 8.1 at BUILD 2014. The new update introduces new features which closer bring the Modern UI experience and Desktop experience together by enabling desktop elements in the Modern UI for mouse and keyboard users. The Windows Phone 8.1 update will be available to all existing Windows Phone 8 devices. However Microsoft was quite vague with the date, suggesting that the update will be arriving in the "next few months". We are going to keep our fingers crossed and hope that it will arrive by before the end of spring. 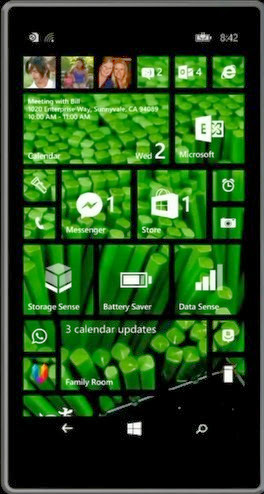 Microsoft did however mention that new Windows Phone 8.1 devices will start hitting store shelves in April or May.